Some children find it hard to focus on a task long enough to learn or complete the activity. They may flit from one activity to another, or focus for only short periods, quickly becoming lost in other thoughts. Fortunately, there are many simple things adults can do to help children focus better. Simple modifications can make a big difference to a child's ability to focus. By removing or reducing distractions, you can help keep your child on task and focused. Before asking your child to begin a task, look around the room and listen. Should you turn off the television? Are there other distracting noises? Can you move to a quieter place? Is there a window, or other children nearby that will distract your child? Closing a blind or seating your child facing away from a window may reduce visual distractions. Soft furnishings, such as rugs, can help reduce noise levels. Reducing or removing as many distractions as possible will make it easier for your child to focus. Seat your child facing a blank wall, or a relaxing poster. Use a bookshelf or curtain to screen off distractions. Use headphones with soft music to help block out noise. Have a box with all the things needed for the task, such as pens, pencils or paper. This will reduce the distraction of looking for items once work begins. Only use the special space for focused tasks. When taking a break your child can move away to a different place to relax then come back when he needs to focus again. Correct seating helps children stay on task longer. Make sure the table and chair are the right height so your child's hips, knees and ankles are all at a 90-degree angle. If the chair is too low, use a cushion. If your child's feet do not reach the floor, place a small stool or a couple of phone books underneath so his feet have a spot to rest. Simple changes to the way you present something to your child can help him be more likely to focus and complete the task. A routine that is consistent and predictable can be helpful in getting a child to focus. Your routine should have regular times for focused tasks such as homework, as well as activities for relaxation and fun. 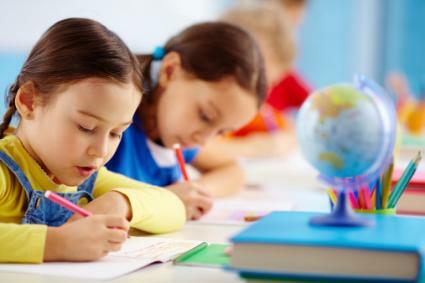 When children know they need to do their homework at a set time each day, and when it is done they can play, they are more likely to do their homework without a battle. Make sure to write up the routine and display it. If your child cannot yet read, use pictures. Encourage him to check his schedule regularly and to check off tasks as he completes them. Add a fun activity at the end of the routine for when the work is complete. Set clear, realistic expectations and give rewards for completing tasks. Discuss what needs to be done and what happens when tasks are finished. For example, you can say, "If you read for 10 minutes then you can play on the trampoline for 10 minutes." Make sure the rewards match the level of focus required. Bigger rewards are for longer, harder tasks, and smaller rewards are needed for short, simple tasks. Write down the reward or use a picture of the reward for non-readers. Be sure to follow through with a promised reward if your child earned it. If your child does not do the task as agreed, you don't need to punish him, but don't give him the reward either. Give simple, clear instructions and make sure children understand what they need to do. These tips will help you make sure that you are making your expectations clear. Get down to your child's level. Make eye contact while speaking to him. Tell him what he needs to do in short, simple sentences. Be specific and emphasize the keywords. Make sure he knows what will happen if he does or does not complete the task. Ask him to repeat back to you what he needs to do. Give your child feedback at the end of the task. Make sure your feedback is honest but constructive. Tell him what he did well and if needed, one thing he could do better next time. These simple tasks, done regularly as a part of your child's day, can help him focus better and for longer. A recent study, published in the June 2014 edition of Frontiers in Psychology, showed just 12 minutes of exercise improved attention in adolescents. The effect lasted for up to 45 minutes after the exercise, and for some children, had added benefits such as improved reading comprehension. A walk, bike ride or a few minutes on the trampoline before a focused task may help your child to pay attention for longer. It's no secret that what you eat affects how you feel. Hunger, sugar and additives such as caffeine, can affect your ability to think and concentrate. Choose My Plate, a program from the United States Department of Agriculture, recommends children have a balanced intake of fruits, vegetables, grains, protein and dairy to support brain development and function. If your child's diet does not meet the guidelines, gradually replacing poor food choices with healthier ones may help improve your child's focus and overall health. There may also be some specific supplements and herbal remedies that prove helpful in improving a child's focus. Sleep is also important for attention and learning and often children do not get as much as they need. The National Sleep Foundation provides guidelines about the amount of sleep required at different ages, as well as tips for helping children sleep better. The foundation recommends eleven to thirteen hours of sleep per day for preschoolers and nine to eleven hours for school-aged children. If your child is not getting enough, increasing his sleep may improve his focus. If you are looking for long-term improvements in your child's focus, music lessons may help. A study from the College of Medicine at the University of Vermont showed learning a musical instrument increased growth and development in the parts of the brain children use for attention and focus, as well as memory, planning, and the control of emotions and behavior. If you have tried a range of strategies and are still concerned about your child's ability to focus, be sure to seek professional advice by speaking with your child's pediatrician, school psychologist or other professional. While reducing distractions may immediately improve your child's focus, changing his diet and sleep patterns can help improve focus overall. Combining support for your child to develop his skills while also making some modifications to his environment will be most effective for long term improvement.